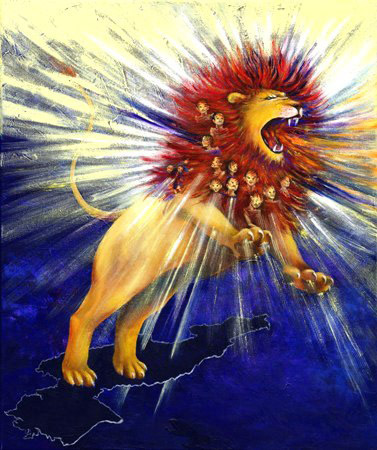 I was commissioned by Hope Flinchbaugh to paint the image for the cover of her book which shares the amazing stories of how Jesus, the Lion of Judah, is bringing children out from under the crushing oppression of the North Korean rule. Many children are fighting for survival in the deepest hiding places. Some escape with the whole intent of getting strong enough to set the rest free. I could hardly paint the little faces. Jesus was so intensely calling that child by name, kissing and rocking that little one in the depths of His love while I was painting the little face. I had to stop in between each face until Jesus would strengthen me to paint the next one. It was one of the most intense intercessory paintings I have done to this point. Oh, what a heart Jesus has for His persecuted people! The cross becomes a stake piercing right through that country (the black wolf-like shape under the Lion of Judah). The Lion of Judah looks almost ‘stuffed toy’-like. I believe it is the way a child would see such a ferocious lion. They would not see the mightiness as a threat to them.